Johnson & Johnson's Lifescan division says it has received clearance from the U.S. Food and Drug Administration (FDA) for wireless integration of its OneTouch Verio Flex glucometer with WellDoc's BlueStar diabetes management platform. In March, Lifescan announced a collaboration with Baltimore-based startup WellDoc to integrate the BlueStar mobile technology for Type 2 diabetes into LifeScan’s glucose monitors. Part of the deal involves J&J contributing an undisclosed amount to a Series B round of financing for WellDoc. "Our partnership with WellDoc highlights our sustained commitment in helping to drive better health outcomes by building a more connected patient experience. Integrating digital solutions such as OneTouch Reveal mobile app and BlueStar will help patients self-manage their diabetes and create value for health care providers," said Valerie Asbury, World Wide President, LifeScan, Inc., in a news release. 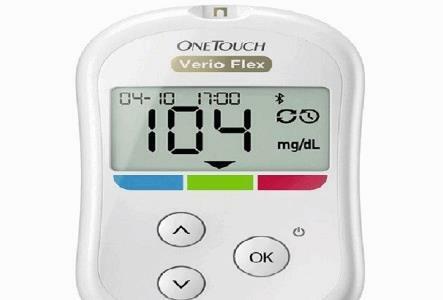 In February, the company introduced the OneTouch Verio Flex device with simple color range indicators to help patients easily interpret their blood sugar readings and stay in better control. Besides being a standalone glucometer, the device wirelessly connects, via Bluetooth, to its companion OneTouch Reveal mobile app, available on compatible iOS and Android mobile devices. The app can store information about blood glucose readings, as well as food, exercise, or insulin data, and can set reminders, like when to test and when to take insulin or other medication. In addition to the OneTouch Reveal mobile app, WellDoc's BlueStar also serves to strengthen the glucometer's diabetes management capabilities. Prescribed by a healthcare provider, BlueStar is software on smartphones and computers that stores blood glucose levels and gives patients a daily guided plan, including motivational tips to help manage diabetes. BlueStar can send data to the patient's healthcare team before each visit, and can calculate the insulin dose based on the physician's treatment plan. "WellDoc Inc.'s patented clinical and behavioral engine will provide patients with individualized real-time feedback and virtual coaching based on the patient's specific treatment plan, and also help health care teams make timely diabetes management decisions. Along with the OneTouch Reveal web and mobile app, the offering seeks to create a comprehensive, data-driven and payer-reimbursed program for the management of Type 2 diabetes," the company stated in the release. According to the American Diabetes Association, Type 2 diabetes represents between 90 and 95 percent of all cases of diabetes, which affects some 29 million Americans, or 9.3 percent of the total population.